The spacecraft flight model had been readied by prime contractor Airbus in the UK. Due to launch in 2020, Solar Orbiter will observe the Sun and measure the solar wind from a minimum of 42 million km away, or less than one-third Earth's distance. As a result, the spacecraft will be subjected to around 13 times the amount of solar heating that Earth-orbiting satellites experience, and to temperatures in excess of 500°C. Solar Orbiter's main body will be protected from direct sunlight by a Sun-facing multi-layer titanium heat shield. The 1.1-m diameter high-gain antenna seen here will be deployed from the body of the spacecraft to, transmit science data back to Earth in high-bandwidth X-band. The antenna's black colour is unusual. 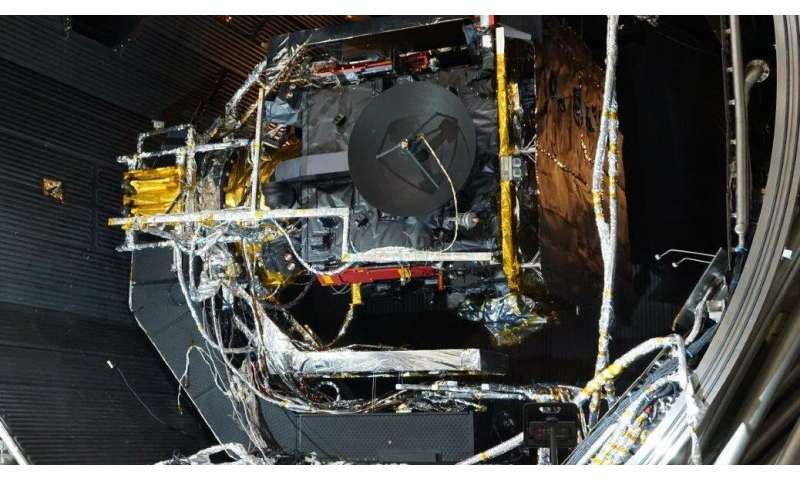 It is covered with the same kind of protective, high temperature coating as the front of Solar Orbiter's heatshield, based on burnt-bone charcoal. Developed by Irish company ENBIO, this 'Solar Black' coating was selected because it can maintain the same colour and surface properties despite years of exposure to unfiltered sunlight and ultraviolet radiation. This test campaign – using powerful lamps to simulate the Sun's radiation – began by simulating the conditions the spacecraft will undergo as it manoeuvres to its operational orbit through flybys of Earth and Venus. "During 99 percent of the mission operations time, the heatshield will protect Solar Orbiter, but there will be more than a dozen manoeuvres when one of the side panels will be exposed to sunlight," explained Claudio Damasio, ESA's Solar Orbiter project thermal engineer. "Therefore, we need to know how the Proto Flight Model responds when the exterior of the insulation on these panels reaches a temperature of about 120–150 degrees Celsius."